Update (11/21/16): In below-freezing weather last night, law enforcement deployed tear gas, water cannons, percussion grenades, and rubber bullets against hundreds protesting the Dakota Access Pipeline. News reports confirm more than 300 people have been injured. Tell the DOJ to investigate and demilitarize police responses to nonviolent #NoDAPL water protectors. The Department of Justice can help stop this militarized response to indigenous activists and their allies fighting for clean water. It oversees the various federal programs that may have supplied much of the equipment being used against protesters – and it can put those oversight measures to use. Thousands from across the globe have joined in solidarity with the Standing Rock Sioux Tribe to stop the construction of the Dakota Access Pipeline. 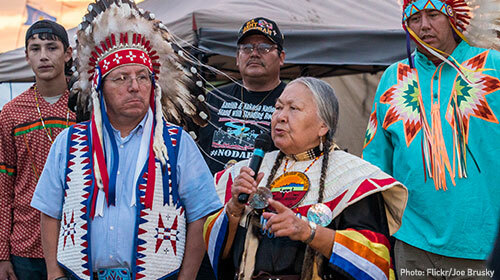 The pipeline could destroy ancestral burial grounds and poison the water supply for an entire sovereign nation and millions of Americans downstream who rely on the Missouri River. This is worth standing up for – these brutal police tactics are not appropriate or just.